Unpublished stereoview of a group of canoes on Sixteen Mile Creek in a 1908 event. 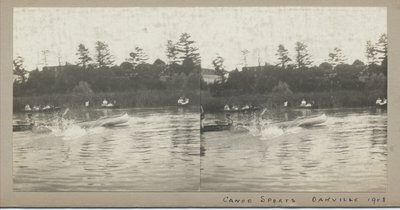 The evidence of the right panel, with one of the men in the canoe standing upright suggests that it is a pair with another stereoview of the canoe tipping contest. Three or four other canoes hover in the background.